“What about it don’t you understand?” I asked. “That’s weird,” he said again. He was still staring at the magnet as though some alternate meaning might reveal itself if he looked hard enough. I waited, sensing a familiar need for processing time. “I have Asperger’s,” he said finally. “And I .. well .. ” his voice trailed off as he pointed again toward the magnet. “I …. no.” He continued after a breath, saying, “I heard once about Asperger’s pride.” He said it as though the very idea of such a thing should clearly strike me as preposterous. “I can’t see that,” he said. “I’m so sorry,” I responded, wishing that somehow I could, right then and there, introduce him to one or two or twenty-seven of my friends. He shook his head as if to reset it, then walked away. In his absence, I evened out my purchase, then returned the nozzle to the pump and closed my gas cap. The man from whom I’d bought a Homeless Voice Street News on the way in gave me a toothy grin and waved enthusiastically from across the parking lot. I returned his smile and waved back, then turned to look for the attendant before getting back into my car. I wanted to tell him that I liked talking to him. That he hadn’t rubbed me the wrong way. That there’s a lot to be proud of – even in disability, especially when many of that disability’s most disabling aspects are caused or exacerbated by your surroundings, not you. That I hope he can someday find a job that interests, challenges and satisfies him. But it was too late. He had already disappeared into his one-man office and closed the door behind him. I reluctantly got into my car and drove away. We’re headed in the right direction. But the pace of progress is glacial. And for the homeless man selling Street news to survive and the gas station attendant with the master’s degree who isn’t even a manager, it’s not nearly enough. Ed note: I in no way, shape, nor form mean to demean the gentleman’s work as a gas station attendant, nor to devalue the job itself. Rather, I relayed and then quoted his feelings about his own job as it relates to his education. I feel sad for him. I’m not sure I have the words to explain, but my girls and I wear our aspieness with pride. We are special, we are us. It’s tough at times (sometimes a lot of the time) but we are still prouder of our skill sets than we are disappointed in our deficits. Where we live there is a lot of acceptance, maybe not enough knowledge in the schools, but they are certainly doing their best and willing to listen and try. My bet is his discussion with you will be mulled over and make a difference to that mans life. Your thoughts and comments are right on. The world needs to accept and appreciate and value everyone. We parents and caregivers are the start in bridging society with people who are different. I was in Boston yesterday testifying at the State House on a proposed bill to help disabled parents and how they are treated during custody issues both through DCF and the family court system. There were quite a few members of the autistic community there and through my terror at the thought of speaking in public, I was thinking that you should have been there. I am glad your magnet started the dialog. Each positive seed put out there may grow, out of our sight. This post reminded me about sharing the Gospel, the good news….is that each person is unique, worthwhile, should be celebrated and loved because God loves us. I haven’t cried over my sons Aspergers DX in a long time but this has me balling at my desk at work. This is my greatest fear for my son. I fear he will not accept himself. He spends a lot of time saying he is sorry after those “teachable moments” that we still have daily at the age of 10. I don’t want him to be sorry but I do need him to learn how not to “rub people the wrong way” so that doors are not shut for him in the future. There’s learning to “not rub people the wrong way” and then there’s hiding who he is. It is imperative that he not do the latter. I wonder if you might be able to go back to that gas station and give him some links to some blogs written by autistic people. Maybe some links to their Facebook pages. It is never too late. You can still tell him you enjoyed talking to him and that he did not rub you the wrong way. I have a feeling if you reach out your hand with some ways to make some connections that he will take hold. He might not but as your father says, “It does not cost a thing to be nice”. Just a thought. I have every intention of going back. Some things have to happen in pieces. Indeed, very small steps. You planted a beautiful seed yesterday and I have every confidence it will grow. A gift you gave to this man. I don’t know if this is helpful, but this organization is growing in the Northeast. 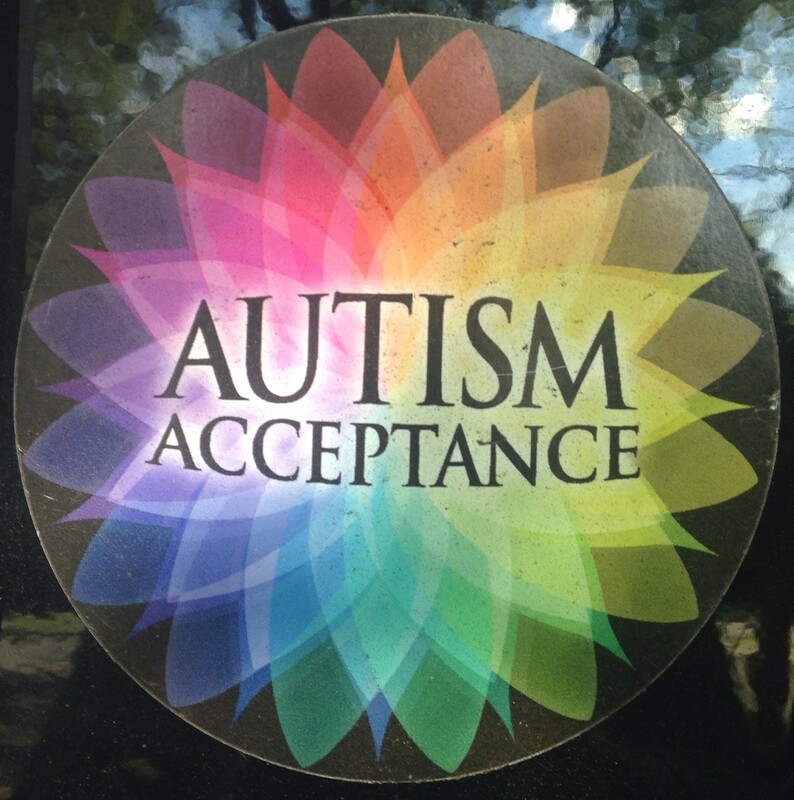 Autistic-specific employer (dad of young man on spectrum started a company). It might not be close enough, but it may give him some hope or direction. What an eye opener! I never thought about it the way he did. To think, it all started with that magnet. So much can come from one proud magnet we display on our car. I know you planted a seed in that young man’s mind. I didn’t feel that you were belittling the job he has. I just think that it’s a shame that this young man with the level of education he has worked hard for and achieved, can’t be working in his field of expertise. We need more people like you in this world, Jess. I believe this young man’s life has been/will be changed all because that’s where you happened to stop for gas and he happened to notice your magnet. It all started with that magnet. I wish I could talk to him. I have a graduate education, too, and I live in my mini-van while I write and work toward the day my writing supports me instead of living on SSI. I get it. But there’s so much more to Autistic me than not being able to keep mainstream employment. So much more. I have lots of challenges and struggles but also lots of beauty in my life, both the result of having an autistic brain. please know how humbled i am by your words and how grateful i am for, well, all of it. you’re so blessed to have one another and i have no doubt that with the obvious love and respect you have for him, you will find your way together. much love — and strength — to you both. There’s also a “contact us” page, so you can ask questions, and they have a Facebook page as well. Take care! I met you this past April in Presquile Isle, ME and was deeply impressed with your spirit, enthusiasm, and devotion. Although he went into his cubicle and closed the door. I do not believe that the door was completely closed. If you look closely, you may find a space that your big toe will fit into, thus preventing him from excluding you from his life. Once you see that, it becomes your responsibility to continue to go to this particular gas station repeatedly until he opens the door and allows you into his life. This is the gift from God that you have been blessed with! Help Him!!! It is not too late. Go Back. So many times in our lives, we ask what if? I know that I am asking a great deal of you, but I know from experience that if we go back after an encounter like this, we can sometimes save a life. God bless you for all you do to help our rainbow children! Hopefully we will get there eventually! Add to the mix pathology-driven diagnosis criteria maligning the person’s behavior and – without distinction – personality traits, and technical websites explaining with authority how wrong and deficient people “with autism” are. Perhaps add also some dehumanization from therapists or school aides forgetting neutrality and instead reinforcing the person’s sole accountability for the stigma they endure. Chances are that self-loathing will come along… and the logic of this negative message can be strong when it’s coupled with a life-long feeling of inadequacy. I wholeheartedly agree with the seed metaphor: placing the simple idea that perhaps the fault is not entirely within, that responsibility for acceptance is a shared endeavor. I have seen this seed grow in our own adult community here. I have tried to plant it myself a few times, gently and tentatively. There is so much beauty in seeing marginalized people start to understand that neurodivergence is one thing, and self-worth quite another. That they can be appreciated and valued for who they are, and not *despite* what they are not. Friendship is a wondrous thing. And sometimes a few simple, kind words and positive ideas from a new acquaintance is in itself an act of benevolent friendship that can change everything in a person’s life. Kudos, Jess. What a pity. Hopefully you can see him again and tell him those things. I understand his frustration, from a slightly different angle. I’ve had 6 jobs in 7 years, all entry level positions that never satisfied me or offered much in the way of upward movement, even when I asked about it. But even the highest levels in these jobs would never be my cup of tea, nor match my particular set of intellectual abilities and interests. I try to find solace in my hobbies and in reading, where I can indulge my interests without worrying if they’ll help me pay the bills. Progress is progress, but I do hope it speeds up. Thanks for the excellent post. Jess-I got this magnet years ago,but can no longer find the organization that created and sold it.Mines so faded I want to replace it. Can you remember which group made these?